Contaminated plastic waste is harmful to your environment, therefore by using disposable peel-off mats and plastic overshoes, YOU are harming your environment. The anti-plastic movement is widespread in today’s day and age. Social media, news websites and near enough all modern day advertising remind us of the millions of tons of plastic waste produced yearly across the globe. With about half of the plastic ever manufactured having been produced in the past 15 years, the collaboration of industry in reducing production and improving recycling is increasing in importance. There are many ways to curb plastic waste—by producing less, consuming less, and better managing the waste that already exists to prevent contamination or leakage. But how does this mentality transfer into the workplace – particularly into environments where contaminated waste is prevalent? According to statistics reported by the World Health Organisation (WHO), 15% of waste generated by health-care activities is considered to be hazardous: infectious, toxic, or radioactive. Contaminated waste contains potentially harmful microorganisms that can infect hospital patients, health workers, and the general public. Other potential hazards may include drug-resistant microorganisms which spread from facilities into the environment the disposal of untreated contaminated waste in landfills can lead to the contamination of drinking, surface, and ground waters if those landfills are not properly constructed. Additionally, to these toxic side effects, open burning and incineration of health care wastes can under some circumstances result in the emission of dioxins, furans and particulate matter. Aside from the environmental impacts of contaminated plastic waste, this can also cause immense problems within the work environment. The hazardous/contaminated waste, coupled with disposal costs created with peel-off mats are not to be ignored. 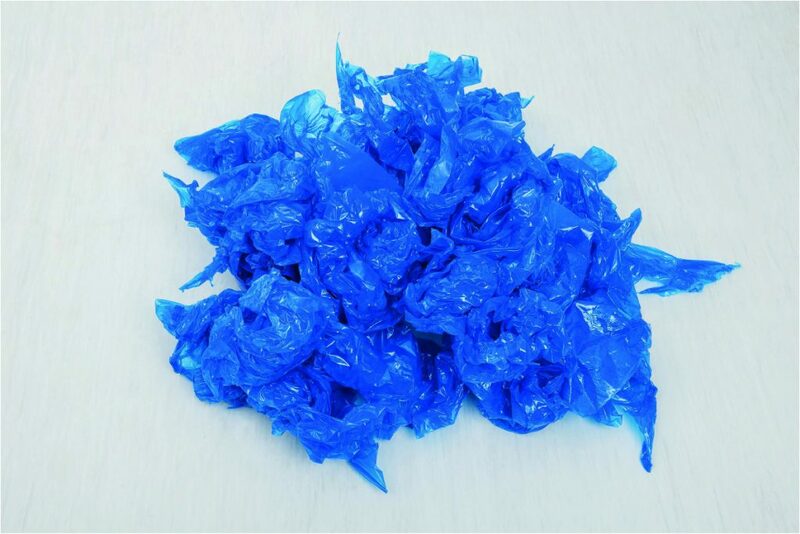 Every peel of a sticky mat results in a 20 cm ball of contaminated plastic waste. With the 20cm ball of waste created when peeling off a mat layer (generating enough waste to fill multiple dumpsters per year), and also being classed as secondary waste, Peel-off mats not only create an abundance of unnecessary waste but are very expensive to dispose of properly at the end its very short working life. Further to the waste and cost implications with the use of peel-off mats, tests by GlaxoSmithKline show that disposable adhesive peel-off mats are only 27% effective in preventing foot and wheel-borne contamination. The average 2’x4’ sized peel-off mat is too small to decontaminate effectively, and this makes full wheel-borne decontamination almost impossible. This, coupled with the usual placement of only one peel-off mat outside critical areas can be very dangerous. Ganging peel-off mats together does address the size issue. However, the practical issues, labour and material costs involved in peeling 8-10 mats several times each shift makes this an expensive option. 10 peel-off mats ganged together means there is a 20% risk of contamination entering a critical area if peeled twice per shift (Source: Mcon). Also, when ganged together, peel-off mats can harbour contaminants in the gaps between them. The performance of peel-off mats is greatly reduced with overstrikes. With every step, contamination builds up in layers on feet. This buildup of contamination on feet with not be effectively removed after one or a couple of steps on that area. In addition, particles readily transfer back onto footwear, increasing the risk of contamination. Peel-off mats also cannot allow the three full wheel rotations necessary to decontaminate wheeled traffic. (link scientific paper on this) These tacky, tearable mats are also prone to wrapping around wheels of trolleys and carts making it impossible to control cross-contamination in corridors. Alongside this they are prone to heavy saturation very quickly, reducing their efficiency in heavy traffic environments. Adhesive from the mats can be transferred onto wheels and tracked into critical environments. A study commissioned by a peel-off mat manufacturer highlighted the problem of particle shedding during the rip up process of peel-off mats. The tests revealed that on average, 215,000 particles were released during the rip-up process – releasing hundreds of thousands of particles back into the atmosphere. Similarly, the use of multiple pairs of shoe covers, per shift per employee add similar amounts of plastic waste expenditures – not to mention the financial implications for the purchase of shoe covers and costs to the disposal of contaminated waste. Many manufacturers and/or distributors claim good traction, durability, waterproof capabilities and most of all contamination avoidance when selling shoe covers. However, the materials the shoes are produced from (chlorinated polyethene, polypropylene, PVC) all have inherent weaknesses that could create a risk to your critical environment. Potential risks with shoe covers, such as ripping and slipping, will depend on the materials they are made from. Polypropylene (PP) presents several problems in a controlled environment setting. PP is a non-woven material, which means that it can and will shed particles. Furthermore, the highest risk is not necessarily through the usage of the shoes but applying them to feet. 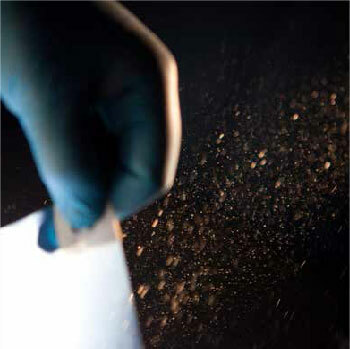 Using dirty/unwashed hands bypasses the purpose of having shoe covers and adds contamination to the underside even before entering critical environments. How can Dycem make a difference? 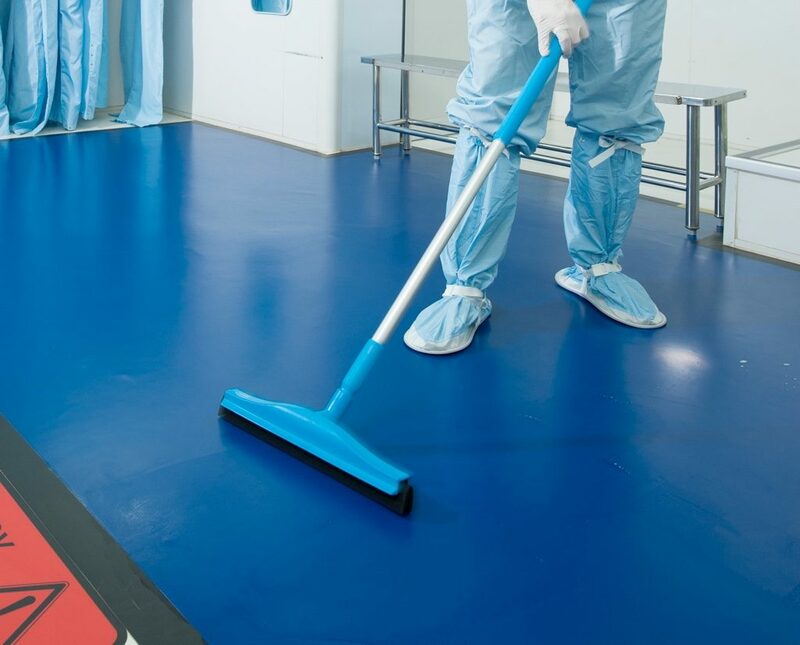 Particularly within industries adhering to strict hygiene standards and needing to reduce dust particles within their working environments, common methods of controlling these types of contamination include shoe covers and overshoes. 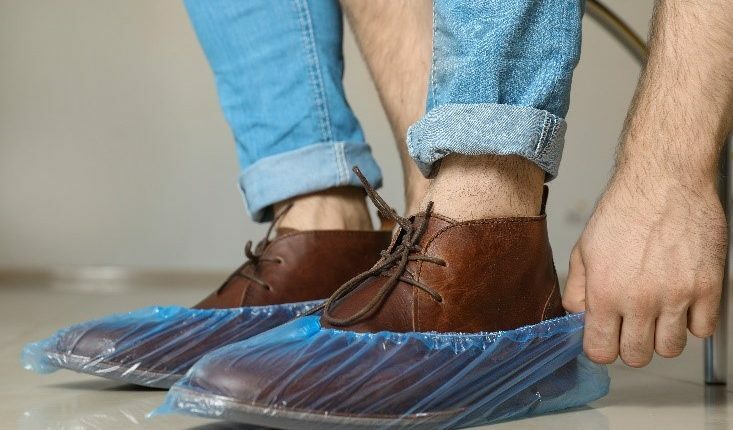 These common contamination control methods such as shoe covers or peel off mats may appear effective however increase your organisation’s plastic waste significantly. 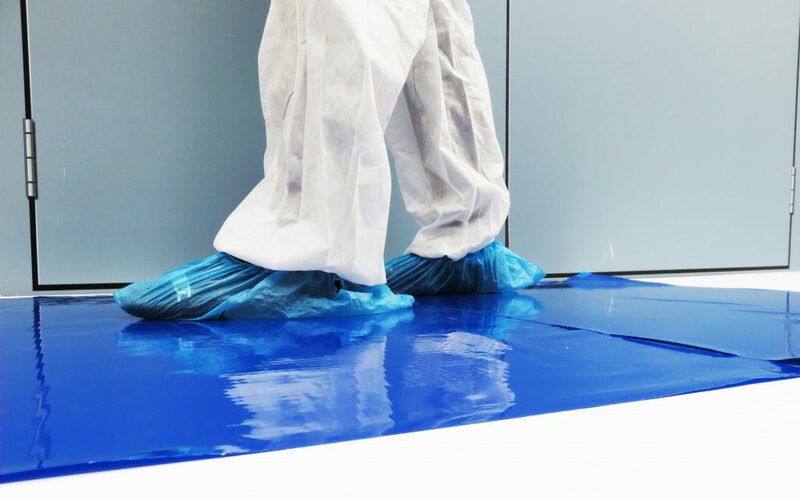 Their low initial cost of alternatives may seem attractive, however, when comparing Dycem with peel-off mats and shoe covers, Dycem not only costs less over the longevity of both products but, most critically, Dycem vastly outperforms in terms of size, quality and retention of decontaminants – significantly reducing contamination risks to your business. 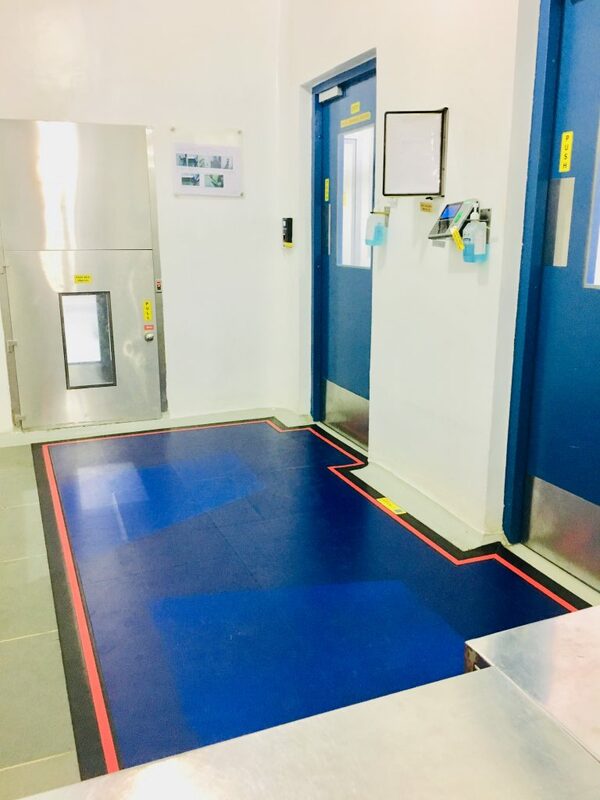 Dycem can be cut to any length or width to produce a large enough surface area to allow 99.9% decontamination of foot and wheel-borne contamination and is washable. In order to get near comparable performance to Dycem, at least 8-10 peel-off mats, tacky mats or sticky mats need to be ganged together and peeled regularly. Dycem is also seamless, thus avoiding this contaminant trap. When overstriking on Dycem a further 90.3% of particles are removed from overshoes, compared with an increase of up to 381.9% being deposited back on to the shoes using peel-off mats. (Source: Dr Tim Sandle). Peel-off mat cost x 10 (to create the size of Dycem) + peels per shift x shifts per day x days operation per year x 2 (Redisposal) Costs. 0 peels required x 2 shifts per day x 7 days per week (12-month replacement contract per pricing matrix). Shoe cover x 2 (= 1 person) x individuals per shift x shifts per day x days operation per year. What also should be considered is time lost putting on and removing overshoes, and the amount of entry and exits per person per day in and out of the environment. Dycem is easily integrated into your SOP and can be cleaned as part of your regular floor cleaning schedule. Dycem does not impact on your daily waste volumes and can either be disposed of normally in regular waste or recycled into less critical applications (after its minimum 3-year working life).